Vietnam was one of the six countries who signed the MEFIN Declaration of May 2013 (also known as Cebu Declaration) and signified support to the promotion of inclusive insurance as a strategy for poverty reduction in the region. In January 2016, Vietnam renewed its commitment to the MEFIN Network which was then formalized as a regional platform for peer-to-peer exchange of knowledge and experiences in inclusive insurance. 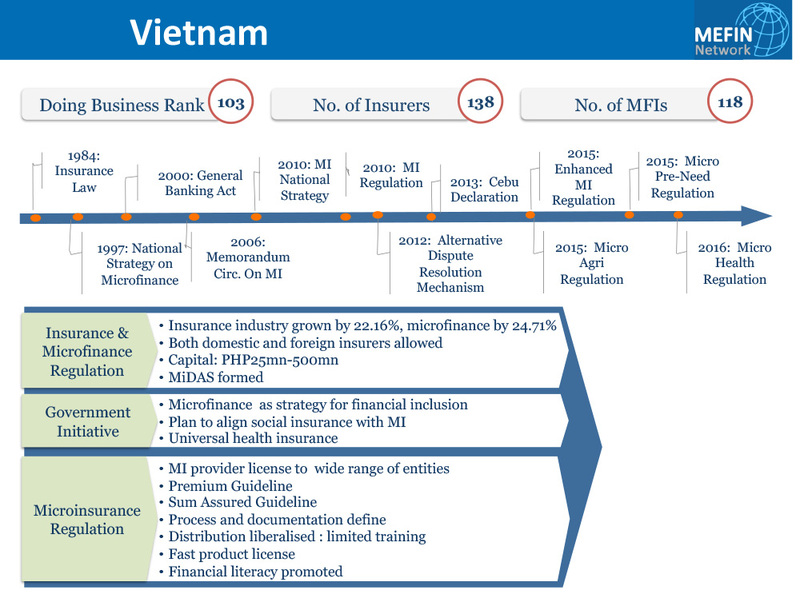 Before the 1990s, the insurance market in Vietnam was dominated by state-owned insurance companies. About 20 years ago, it started liberalizing the insurance market which opened the gate to the participation of the private sector which includes both domestic and foreign-invested companies. The Insurance Supervisory Authority (ISA), a subordinate body within the Ministry of Finance (MOF), and the MOF itself, are the two key regulatory bodies that oversee insurance activities, including the establishment of insurers, sale and purchase of equity interests in insurance companies, the formulation, sale and implementation of insurance contracts, and other insurance-related activities in the country. Vietnam is a socialist republic with a government that includes an elected legislature and a National Assembly. The Vietnamese Communist Party holds the political reins. The national economy is dominated by manufacturing (37%), services (35%), and agriculture (28%). Vietnam is also the third-largest oil producer in Southeast Asia. The principal economic zones are located in the suburbs of Vietnam’s largest cities, Ho Chi Minh City and Hanoi. Vietnam's Gini ratio, the coefficient that measures inequality among income distribution, lies at 35.6 and the HDI at 0.666. Vietnam is the world's 14th-most-populous country, and the eighth-most-populous Asian country. In 1986, the government initiated a series of economic and political reforms which began Vietnam's path towards integration into the world economy. By 2000, it had established diplomatic relations with all nations. Since 2000, Vietnam's economic growth rate has been among the highest in the world and, in 2011, it had the highest Global Growth Generators Index among 11 major economies. Its successful economic reforms resulted in its joining the World Trade Organization in 2007. Vietnam's Gini ratio, the coefficient that measures inequality among income distribution, lies at 35.6 and the HDI at 0.666.